Obituary – Briscoe, Frank « Perry High School Alumni Association, Inc. Teacher of Agriculture and Chemistry. Athletic Coach. ﻿Funeral arrangements were pending Monday for Frank Briscoe, 76, regarded as the founder of high school wrestling in Perry, who died at 7:35 a.m. Monday at Stillwater Municipal hospital following an illness of several weeks. Briscoe was first hospitalized in Stillwater and later moved to University hospital in Oklahoma City, where he was a patient in the intensive care unit for several days. He was returned to the Stillwater hospital Sept. 4. Briscoe, whose home was at 1804 West Fourth street, Stillwater, was born Jan. 8, 1899, north of Perry. He was a 1922 graduate of Oklahoma A&M college at Stillwater. 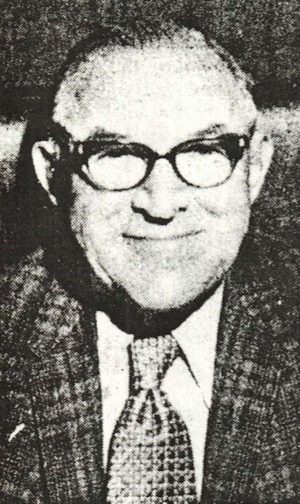 Briscoe began Perry’s wrestling program in 1922-23. He served as Perry’s first wrestling coach and continued to coach at Perry until 1928, when he was succeeded by Kenneth Coldiron. Briscoe and the former Margaret Denton were married Aug. 30, 1925, at Red Rock. The couple moved to Stillwater in 1941, where Briscoe most recently was associated in the highway construction business with his brother, Jack. Briscoe was a member of the Christian church. Although he lived in Stillwater, Briscoe was a familiar sight on the streets of Perry. He came here almost every day, looked after farming interests and visited with friends and acquaintances. He was a close friend of John Divine, Perry Chamber of Commerce manager, who took over PHS coaching duties in 1931 and guided the consistently winning Maroons for 30 years until his retirement. In addition to his wife, of the home address, survivors include two sons, Andy Briscoe, Boulder, Colo.; and Ed Briscoe, Tulsa; a brother, Jack, Stillwater; and eight grandchildren. “A winning football team,” it is said, “usually reflects the personality of its coach.” Frank Briscoe Director of the department of Athletics, spent four years in the Oklahoma A. & M. College. He entered in 1917 and finished in 1922, with the bachelor of Science Degree, having specialized in animal husbandry in the School of Agriculture of that college. While in Stillwater, Briscoe attained not only state but national prominence in athletics. His major sports were football and wrestling. It is seldom that a graduate of a high school returns there in after years to become its football coach, and at the same time one of the greatest in the state. “By his stead﻿fast service to the athletic teams of Perry High School, and his friendship with the students, he has won their confidence and support,” his friends say. Briscoe, by his training, is probably the best all-around high school coach in Oklahoma. At the A. and M. College he won two letters in football and three letters in wrestling. He was captain of the 1922 all-state matmen. For three years Coach Briscoe held the welterweight championship of Oklahoma in the 145 pound class. He also held the southwestern championship for one year. 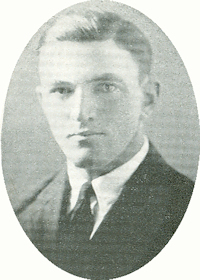 Briscoe, as captain of the 1922 A. and M. College mat squad, was acclaimed throughout the state as the “scissor king.” In three years he lost but two falls in his own weight; one to the present amateur welterweight of the world, Wannatikka; the other to Kepple of Purdue University, intercollegiate champion of the United States. It was at Birmingham, Alabama, at the national A. A. U. meet in 1920 that Briscoe won his way into the finals, then lost to Wannatikka of the New York Athletic club, who won the world’s title a few months later in the Olympic games at Antwerp. Although weighing but 149, Briscoe wrestled in classes ranging from 158 to 185 pounds. In collegiate matches in this state, he often doubled, by wrestling in two different weights in one match. Briscoe is a member of the Beta Theta Pi, national social fraternity, and was also a member of the “O” club, consisting of all letter men of the A. and M. College. Knowing that Frank is so reticent as to make a newspaper reporter despair, we have nevertheless been successfully rewarded in our attempt to find out something about him.